It’s time for a new “Vising Battlefields” report! This time, we didn’t travel the Ardennes or visited another WWII battle site (which was the focus of our previous battlefield tours), but we traveled far back in time into the year 496 AD. 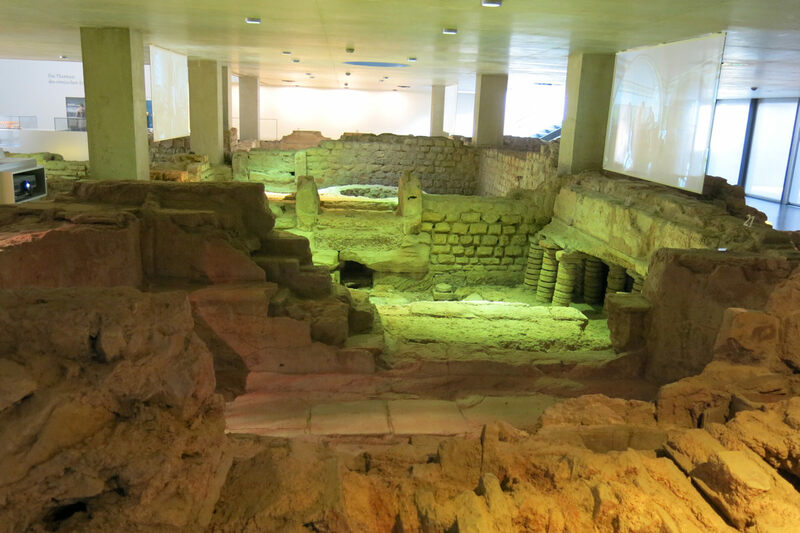 We were on our way to the city of Zülpich (once a Roman vicus named “Tolbiacum“, dating back to the 1st century BC) to visit the Roman thermae (baths), which are still in excellent shape and very well presented in the “Museum of Bathing Culture”. 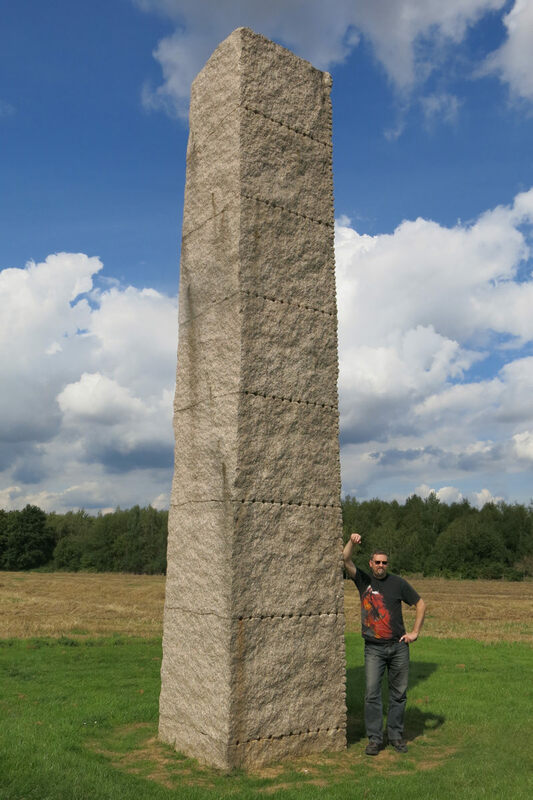 On our way through the plains of the Zülpicher Börde – an area strongly dominated by agriculture and the Rhenish brown coal fields -, we came upon a large field with a striking granite stele. This stirred our interest and we pulled over to investigate the place. 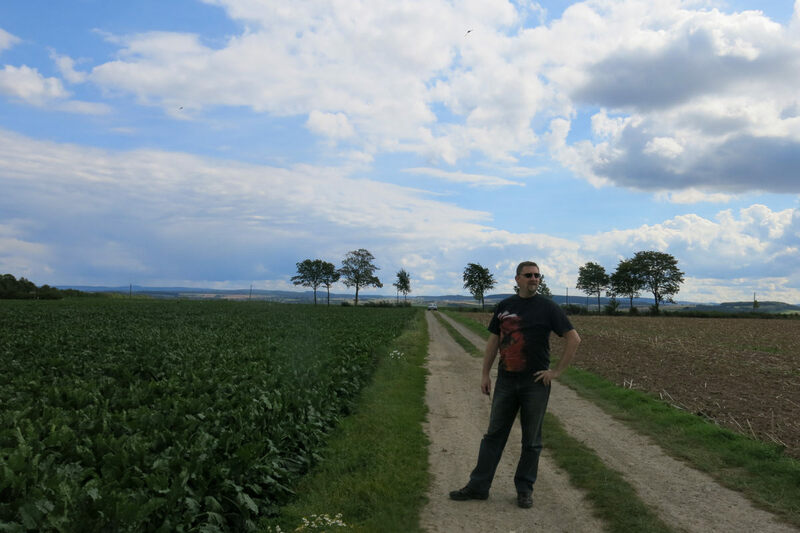 Close to the country road was a bronze plate and we learned that this was the original site of the Battle of Tolbiac, the famous battle of Clovis I (German: Chlodwig I) and his Franks against the combined tribes of the Alamanni (whose leader is unknown). This was one of the decisive battles in late antiquity because it was the main reason why the Franks converted to Christianity – thus opening the way for Charlesmagne and his deep impact on European history some centuries later. Clovis’ victory led to the foundation of the Merovingian Frankish Empire. 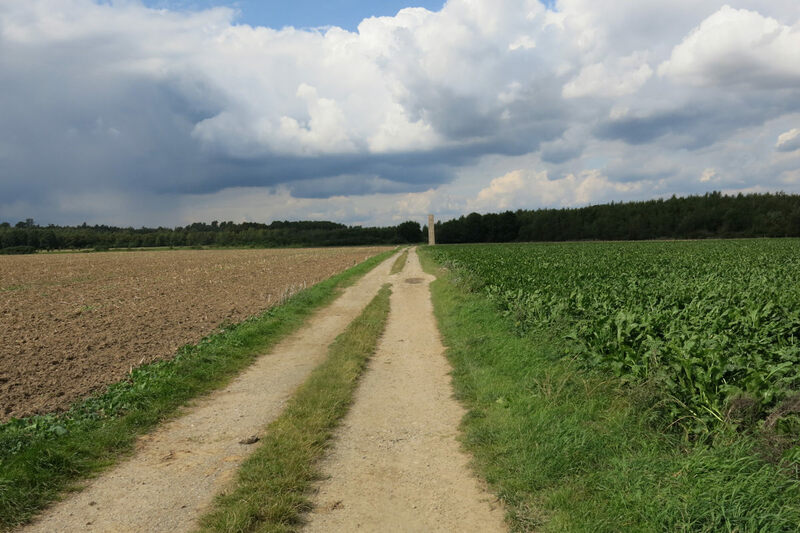 The battlefield is located between the villages of Langendorf and Wollersheim North of Bundesstraße (Federal Highway) 256, close to Zülpich and about 60 km East of the German-Belgian border. Zülpich, or Tolbiacum, was located in the Roman province of Germania inferior at an important Roman crossroads – similar to the Belgian town of Bastogne – because all major Roman roads met here: The Via Agrippa, connecting Trier (Augusta Treverorum, the second largest city in the Roman Empire, therefore also called Roma Secunda) with Cologne (Colonia Claudia Ara Agrippinensum), as well as roads to the Lower Rhine to Xanten (Colonia Ulpia Traiana) via Neuss (Novaesium), to Bonn (Bonna) and Jülich (vicus Iuliacum). Because of its strategical and logistical importance, Tolbiacum flourished during Roman times and was an important location for hostels, horse changing stations and trade. The public baths (Thermae) were very luxurious, especially in these remote parts of Germania inferior. Today, they are among the best preserved Roman baths North of the Alps and well worth a visit! During the 5th century, the entire region suffered under repeated German invasions where German tribes from the areas East of the Rhine raided the cities and villages of the Western provinces. Eventually, Rome withdrew from this area, and combined German tribes advanced into these lands (which were originally inhabited by a local Celtic population like the Eburoni, who were eradicated by Iulius Caesar during the Gallic War, or the Treveri, who dominated the areas between the Eifel, Moselle, and Ardennes region for centuries) as well as Rome-loyal Germanic tribes like the Ubii. 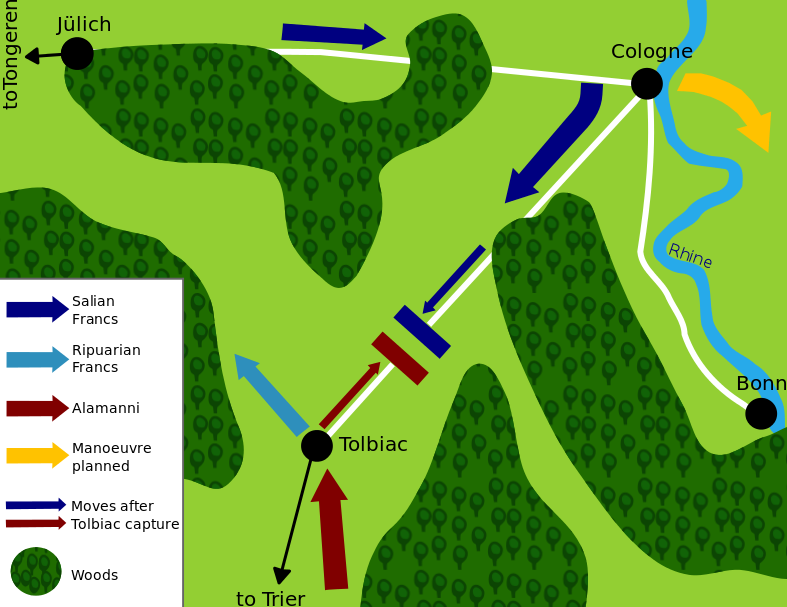 The year of the Battle of Tolbiac (German: Schlacht von Zülpich) is not undisputed – most sources date it back to the year 496 AD, but there are also sources which claim that the Battle was fought in 506 AD. The battle is also known as the “Battle of Conversion” (German: Bekehrungsschlacht). It was fought between the united Ripuarian Franks (led by Sigibert of Cologne) and Salian Franks (led by Clovis I) against the attacking Alamanni, a confederation of several Germanic tribes. Since the Alamanni repeatedly raided the lands of Sigibert, he eventually called on Clovis I for help. It was the second battle of Clovis I against the Alamanni forces; the third battle in Straßburg eventually led to the end of the Alamanni Empire. Whether the plains near Zülpich were the actual battle site is also disputed; some researchers claim that the location was too far in the North for the Alamanni. Others argue that the Alamanni used the old Roman highways between Metz, Trier, and Cologne for their attacks against the Franks (who were also in conflict with the Visigoths under Alarich II at this time, so that the Alamanni probably considered them to be a weakened target). So Zülpich, as a Roman crossroads town, was likely on their route. Not much is known about the battle, except that the Ripuarian Franks suffered heavy losses.The main account of the battle was written down by Gregory of Tours, a Gallo-Roman historian, bishop of Tours and leading prelate of Gaul. He is considered to be the main source for Merovingian history. The battle was desperate, and finally Clovis I began to pray to the Christian God – the God of his wife Clotilde – after his gods apparently didn’t answer. His prayer was quite pagan, though: according to heathen custom of “do ut des” (“I give, so that You will give”), he made a special deal with the Christian God: if the Franks were victorious in this battle, he would convert to Christianity and let himself be baptized. According to Gregory of Tours, the Alamanni leader was killed by an axe just in the same moment, and the remaining Alamanni fled the battlefield. The Franks followed them, killing the fleeing Alamanni until they surrendered. This story closely resembles the conversion of Constantine the Great during the Battle of the Milvan Bridge. After their defeat, the Alamanni left the Ripuarian kingdom and withdrew to the South. Clovis I respected the Ripuarian claim on the territory, but demanded their assistance in fights against the Visigoths later in return for their help against the Alamanni. Clovis I delivered on his promise. 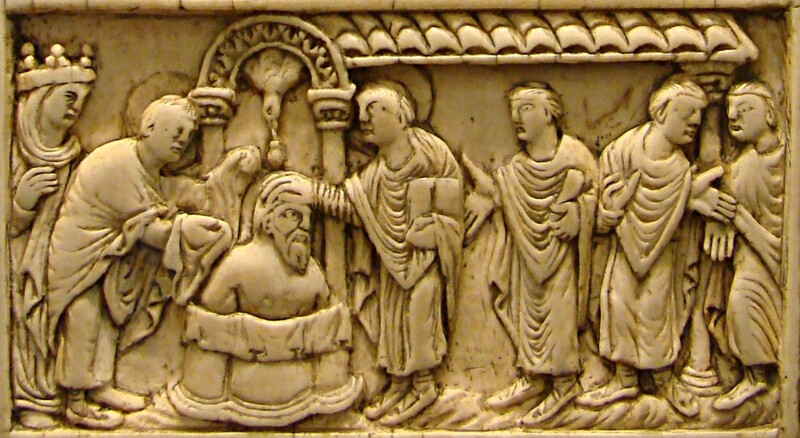 He was baptized in Reims on Christmas in 496 AD (this date was firmly attested by Gregory of Tours and in a letter by Avitus of Vienne who congratulated Clovis on his baptism). 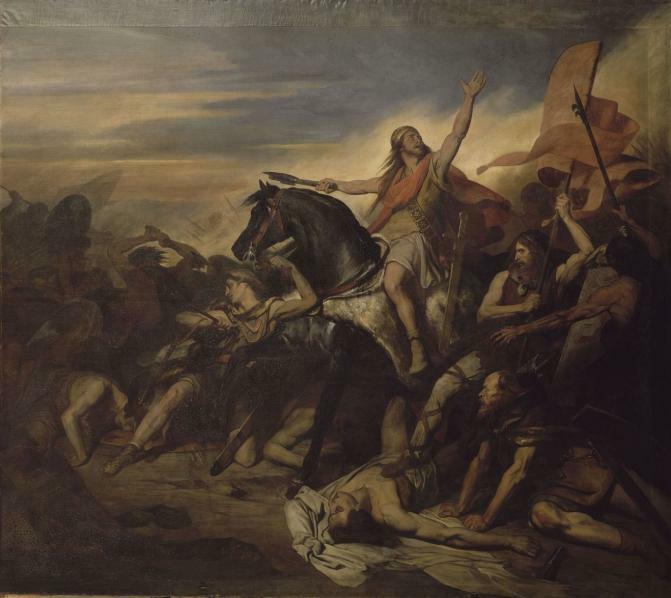 In contrast to the Romans, where conversion or belief in a specific deity was a personal matter, the conversion of the Germanic leader had impact on his entire tribe, so his men soon followed their king’s example. Since the battlefield is located in a rural area, you can simply park your car next to the field. There are no signposts, but you cannot overlook the granite stele which is widely visible from the highway. A footpath across the field leads to the granite stele, which serves as a Memorial of the battle. 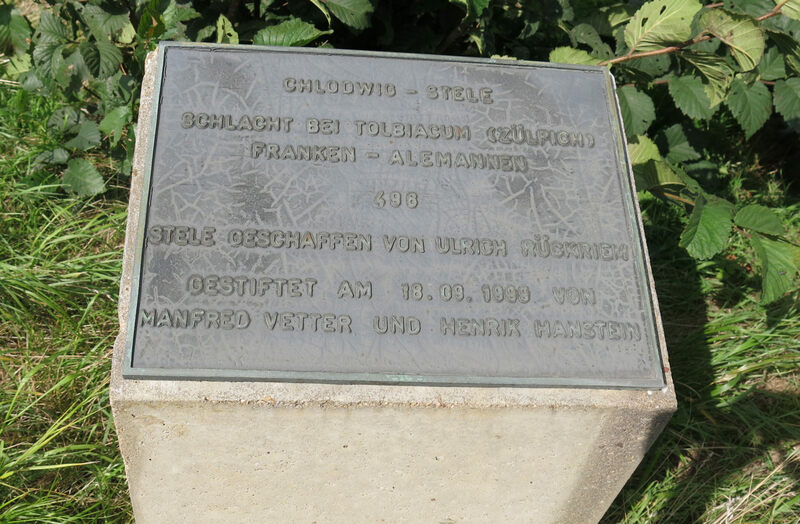 A bronze plate contiguous to the road informs about the site (and the stele) – unfortunately, the text is only in German. It reads: “Clovis stele. Battle near Tolbiacum (Zülpich), Franks vs. Alamanni 496. Stele created by Ulrich Rückrieh, donated on September, 18th, 1999 by Manfred Vetter and Henrik Hanstein”. As the text suggests, the stele was built by sculptor Ulrich Rückrieh, who also built more steles around the city of Düren. The Clovis stele, which is made of solid granite, is several meters high. It was gifted to the city of Zülpich by the “Manfred Vetter charity foundation for Arts and Culture” and financed by Professor Hanstein, who paid a symbolic price of 100,000€ for the monument with one condition: The money had to be spent for a specific purpose – for the installation of the Museum of Bathing Culture, thus for the conservation and presentation of the ancient Roman baths of Tolbiacum. So the granite monument contributed to the preservation of the Roman heritage of Tolbiacum while serving as a memorial on a battlefield site – a good deal! The entire area of Eastern Gaul / Germania inferior is full of Roman heritage sites, temples (especially for the Gallo-Roman Matronae, but also temples for Mercury, Apollo-Grannus, Lenus-Mars, Sirona, Epona etc. ), Roman industrial sites like millstone quarries, iron smelting factories, civilian sites like baths, villages, villae rusticae (Roman rural estates), and last but not least, military sites like castles, forts, and fortifications. So traveling around western Germany and visiting Gallo-Roman places is a worthwhile alternative or addition to visiting WWII sites and highly recommend! Some of these places are UNESCO world heritage sites, and many are among the best preserved or largest North of the Alps. The battle of the Franks under Clovis I against the Alamanni was a key moment in European history and the beginning of the rapid spreading of Christianity all over Europe. Does anyone know of a wargame or scenario about this decisive Battle of Tolbiac? Since there isn’t much knowledge about the battle, the size of the participating armies or even the name of the Alamanni leader, it’s certainly difficult to design a game of this battle (at least without improvising or without assumptions and well-educated guesses about how this battle would have been like). But nevertheless, there are so many wargames about exotic and unknown battles, for example in magazines or published by companies like SPI, who were not fazed by uncommon locations and eras, that there may be a small chance! If you know of a wargame or (scenario within a game series) dealing with this specific battle (or, on a larger scale, of the battles between Franks / Alamanni / Visigoths in the 5th, early 6th century), leave us a comment!